All right. I'm well into my documentation for creating your own timeline. I hope that it will be finished, tested, and posted to the Internet within two weeks. I've put a quick timeline together and I generally like the results. There are a few drawbacks at the moment. For instance, there is not a way to build a timeline with a group. I assume (or at least hope) that Timefo is planning on implementing such an option. I also think that they could do a better job explaining the difference between tags and labels and the tags could be better implemented. At present, it doesn't seem like you can search among events based on tags. At least, I haven't been able to do this on my timeline. Finally, when you click on an event, you almost always have to scroll down to read it all. The event description and the timeline never seem to fit completely on the screen. And it's not like I'm using small screens or resolution here in ECIT. I came across Timefo through a post its authors made to the SIMILE listserv in January. In it, they suggest a few things they have planned for the future. These include populating a timeline with RSS (one hopes that it continually updates, unlike xtimeline) or Google Spreadsheets. One proposed feature that I like is the option to share the events on your timeline. What that means is that others could remix your events into their own timeline. So they are thinking about mashing up their own data from the beginning. Very smart. Right now, Timefo is not really ready for public use. For one thing, it's still not really accepting sign-ups. (FYI You can sign up using the link that I've provided.) And it's lack of group building tools means that at the moment it isn't what I've been looking for in a timeline. But that doesn't mean it can't become that in the future. An article in today's Chronicle of Higher Education by Jeff Young examines the growing use of Twitter in academia. I was excited to see this article come out as I'd done a phone interview with the author regarding my recent blog post about Twitter. David Parry/academhack and Jason Jones both make appearances. Unfortunately, my comments seem to have not made the cut. I say unfortunate not only because my vanity can always use the boost, but also because what Jeff and I talked about was specific applications for how Twitter could be used in a classroom. To me, this is the real question: is it valuable for reaching an pedagogical goal? Nevertheless, the article is worth reading...especially since Jeff does a much better job at concisely explaining how Twitter works. Just in case you are waiting with breathless anticipation for my instructions for creating your own timelines, you might want to check out Tom from Bionic Teaching's Tutorial on Exhibit. It was apparently written before Exhibit 2.0 was released, so there's a chance that it won't be perfect. Nevertheless, it's very good at walking you through what you need to do. I think the service my tutorial will provide will be to address at more length the different options in the timeline view. As you can see, you get scrolling. You get photos. And you can even embed video within the timelines. The interface for posting the events to the timeline are very straightforward: the basic sort of forms you would expect to see on such a website (or on my Google Forms Timeline). Each timeline can have multiple authors and can (obviously) be embedded in different websites or the blog of your choice. You can track the history of modifications made to events on your own timeline and revert back to a previous version of the event if something goes terribly awry. xtimeline also spaces events appropriately. What this means is that when there's a lot of events, the timeline shifts its units, as you see in the gap between Hemingway's birth and the next event. (You can do this same thing with Exhibit, but it's hard-ish.) Another advantage: you can upload photos directly to xtimeline, rather than having to use photos that are already hosted somewhere. This is a small thing but is important for making the process as simple as possible for those who don't know how or where to upload their own photos. All in all, I would have to say that the process of building a timeline on xtimeline is easier than it is when using Exhibit. However, for all the ease of xtimeline, there are some definite things that detract from the experience. The most important, in my book, is the process for building a timeline collaboratively. The best way to do this should be to start a "Group," have others join the Group, and in the language of an xtimeline blog post, "work together on creating timelines." The blog post indicates that the Group creator will have admin controls over every timeline in the Group. Furthermore, it says that the Group creator will be able to specify granular control over whether members can "modify all events (full cooperation) or only modify events they have created (limited cooperation)." Wow! That sounds great! It means that my students wouldn't be able to change each other's events or delete them on accident. But it turns out that nothing in the Groups works the way it should. You cannot create a timeline within a group. Rather, you have to create one on your own and then post it to the group. Group members do not automatically get access to the timelines in the group to which they belong. What's more, I'm a Group creator (my group has one other user, the indomitable Erin Sells) and I have no controls over what the other Group members can do with the timelines (which is just as well, I suppose since they can't really edit them). I have been able to add Erin as an Editor to both of my experimental timelines. But I don't see the promised controls. And while it wasn't difficult to make her an Editor, it still took a step or two more than I would have liked. Using Exhibit, I know more or less who has control over the data (everyone, if you give them direct access to the spreadsheet; only me, if you use Google Forms). That's the main problem. There are other problems with different xtimeline features. For instance, a very nice and easy way to start a timeline is with an RSS feed. I took the feed from this blog, put it in xtimeline and within 5 seconds, it spit out this timeline. But we all know that what is appealing about RSS is the way that it pushes events/information toward you. So what you'd expect from a timeline generated from an RSS feed would be that it would continue to get updated via RSS. That's not the case. You can go back and add more events via the RSS feed. But that gets a bit tiresome. (I wonder, however, what you could do if you ran a Yahoo! Pipe through xtimeline...). For the record, I think you could run a dynamic RSS feed through Exhibit, but I haven't tried to do this yet. You can do text searches or display events from only particular categories within Exhibit. I've been unable to find something similar in xtimeline. You can host your timeline wherever you want. The above means that you don't get any ads, which are small but still there on xtimeline. Ads + educational tool=problem, in my mind. Exhibit can have multiple timeline bands. xtimeline gives you two. In reality, two is what you need most of the time, but as the Victorian Age Timeline demonstrates, it can be useful to have others. Plus you can grab and drag the different bands with Exhibit and they scroll at different rates. And we all like pretty. Because you are responsible for writing the HTML for your Exhibit (at least until I finish [or start] my documentation), you have much more control over what your timeline will look like. Of course, this involves knowing HTML and some CSS. But it turns out neither of those is that hard to pick up once you get going. Exhibit works very well to generate a timeline. But the timeline is only one possible facet. The other views, especially Google Maps, add several other ways to interact with and view your data. And these extra modes of visualization increase the learning possibilities for your students. Exhibit is open source. Thus, it has indie cred. Now, I have to admit that I'm partial to Exhibit. I have to be, otherwise I've spent a lot of time working on it for, well, for my own education, I suppose. I've also not spent nearly as much time with xtimeline, so I might not get its ins and outs yet. Finally, I would suspect that xtimeline is working to fix things like the Groups functionality (although I've seen nothing to suggest it) and would be very surprised if they didn't integrate it with Google Maps. xtimeline is still perhaps the best solution for someone who doesn't yet have a mystical Exhibit tutorial to work from or who wants the easiest tool for creating a timeline. It's worth playing around with. N.B. Inspired by xtimeiline's capabilities, I have just tested the Exhibit-based timelines I've been working with, and I'm pleased to report that I can embed video in them. (Granted, YouTube does the hard work with the hosting and the embedding codes.) 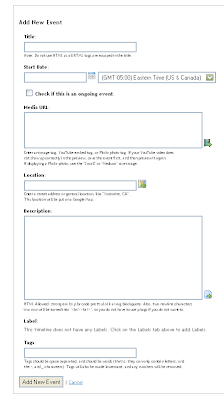 For an example, go to the Google Forms Timeline and restrict the results to the "Video" event type. It does seem to be fickle depending on which browser you use, by the way. Google Forms Timeline is Back! Hurrah! As I wrote previously, the Google Spreadsheet was forcing dates people entered with the form into a MM/DD/YYYY format rather than the YYYY-MM-DD format that Exhibit can read. Google Docs defaults to the former display mode for dates, but you can change the output for each column, and I had done so. I expected that doing so would correct the problem. The spreadsheet was showing the correct date format, but the timeline still wasn't showing the events that people had entered. I just figured something else was wrong. But Tom's comment led me to check the Exhibit JSON on the timeline (the orange scissors you see when you hover your mouse over the timeline). And it turned out that even though I'd changed the formatting of the dates within the spreadsheet, they were still outputting incorrectly to Exhibit. I went back into the spreadsheet and changed the column formatting for the dates to plain text. And now that I've reentered the events, everything is suddenly working. What I think this means is that although I was telling the spreadsheet to output the dates in a certain way that it nevertheless stores dates in MM/DD/YYYY format on its backend. It will change how it displays them to you, but as far as Google is concerned the data stays the same. And it obviously stayed in this default format when going out on the feed and consequently couldn't be read by Exhibit. Changing the columns to plain text will prevent the spreadsheet from cramming my data into a format that won't work. What this means is that you can feel free to start adding events to the timeline. Try it out. I still believe, as I wrote in my first post, that there are some real reasons to give students access to the whole spreadsheet for creating a timeline. But this certainly presents another option. David Parry from academhack has a new editorial at Science Progress that advocates for the importance of digital literacy and uses the Wikipedia as a model. Good reading. Okay, this is a bit embarrassing. After posting both here on my blog and writing to the SIMILE listserv, it now appears that the Google Form Timeline is not functioning as it should. There have been at least three people who have used the form to add an event to the spreadsheet, but they are not being plotted on the timeline. At first I thought that it had to do with the way the dates were formatted: the spreadsheet was forcing them into a format that Exhibit doesn't read. However, I've corrected that and I'm getting nothing, not even events that I've added subsequently added directly to the spreadsheet or via the form. I tested this process with three different people this afternoon and didn't have any problems. Firebug isn't showing me anything wrong with the page. I'll work on hunting down what the problem might be tomorrow afternoon. Thanks for the interest thus far. Basically, sharing a spreadsheet with other people in the past required them to sign up for a Google Docs account. In order to skirt this issue, Google has allowed you to create forms to generate the data within a spreadsheet. I've spent a little time playing around with this feature, wondering if I could get this to work with my timelines, which, as you know, are powered by Google Spreadsheets. The result is the Google Forms Timeline. You can add an event (or 18) to the timeline by filling out the form. A link is provided on the timeline's page, but you can get there from here as well. You can see the actual spreadsheet here. In the first place, students don't have to interface with the actual spreadsheet. This is good because the spreadsheet isn't easy to understand in and of itself. There's no place for instructions within it as there is within a form. There is no chance that the students could do major damage to the spreadsheet (erasing large chunks, etc.) because they aren't allowed to touch it. If students make a mistake on the form, there is no way for them to correct it since they don't have access to the spreadsheet. They would have to email you, and you would have to log in and change things. This could happen repeatedly. More importantly, by not giving them access to the spreadsheet, it feels to me as if the entire process could become less collaborative. In other words, if students aren't interacting with the entire data set, it will feel less like a wiki and, maybe, even less dynamic. They can't repeatedly make small changes to their events and watch them update in real time on the timeline. In my mind, I'm not sure that the advantages outweigh the disadvantages. I've always really liked the wiki/collaboration idea of this project. And I like the fact that the students are interacting with the database without the intermediary step of a form. The form might be easier in the short run, but it somehow makes the exercise or assignments that might come from the timeline less intriguing to me. It's common knowledge that you can tell how au courante a person is by the rate at which they adopt particular practices, objects, or technologies. I'm here to tell you that I downloaded the new Radiohead the morning it became available. But as far as my newest tool is concerned, I'm about as courante as a Commodore 64. Within the past month, I've been playing with Twitter. Apparently Twitter was very, very cool last March. I never even heard of it until this January, which tells me that I haven't been reading enough articles in Wired. Or even the Wall Street Journal. But now that I know about it, you're going to know about it. Twitter is basically a platform for telling others what you are doing right at that moment. In other words, it works in a similar way to a person's status on Facebook. Like Facebook, you can view a person's status online and update your status online. One thing that differs about Twitter from Facebook, however, is that you don't have to log in to a platform to read about a person. Each Twitterer gets his or her own URL, where people can go to see the person's stream of updates. For instance, my url is twitter.com/briancroxall. You'll also notice that you can get an RSS feed from the page, so you could receive each of my "tweets" (what an individual Twitter post is called) in your RSS Reader of choice as they appear. Once you have an account, you can watch what other people are doing on the public timeline. But where Twitter really excels is when you find friends that are also using the service. You can choose to "follow" another person on Twitter. What this means is that everytime that person updates his or her account, you receive their update on your timeline. In essence, this gives you real-time updates of what I'm doing. Yeah, I know: thrilling. You can follow as many people as you like, which can result in a relatively noisy stream of information. Particularly idiosyncratic Twitterers have already become popular and mini celebrities. But there are also real celebrities using the service. Barack Obama and John Edwards, for example, have pages and each are being followed by more than 5000 people. What this means is that Twitter becomes an effective means for information dissemination from sources that you trust or from friends whom you want to know more about. The connection to mobile phones and SMS explains why you can only use 140 characters in Twitter posts. Text messages can only be about 160 characters, so Twitter allows you to have 140 of them. An added benefit of this restriction is perhaps the fact that you have to practice brevity in your writing. And, dear readers, you know that I can really use some brevity in my world. Once you've set up your phone or IM to work with Twitter, you can use one more feature of the service, which is to "track" particular terms. If you send the phrase, "track ecit" to Twitter, then every tweet that goes through the system that contains the word "ecit" will be sent to your phone/IM, regardless of whether it originates with a person you are following or not. academhack writes about using this function during MLA to track the word "MLA" and thereby getting a sense of how Twitter was being used by conference participants and disgruntled partners/spouses who are annoyed to see their family members jet off right in the middle of the holidays. Tracking, by the way, only works with your cell phone or IM. You won't be able to track things online. Okay, so now that we have covered how the service works, perhaps we can talk about how Twitter can be used in a classroom since that's what I'm most interested in with all these technologies. Why would you want to get your students using Twitter? Why do you want to know every banal detail about what is going on in their lives? And why would you want to get it sent to a mobile device rather than simply watching their Facebook profiles? A good place to start thinking about these questions could be a Twitter assignment that academhack gave to a class last semester. The students had to follow his Tweets and had to sign up to follow other classmates. As the students began Twittering, academhack or academicdave, as he's known on Twitter, noticed that the result was that his class began to have conversations outside of class and that the students became more comfortable in discussion within the actual classroom. What happens, in short, is that the students developed a community and a sort of sixth sense as is discussed in the Wired article I linked above (and which I found via academhack's Twitter assignment). You can read academhack's thoughts about the assignment and about the larger implications for academia with Twitter on his blog post. I have to credit this post for getting me to start thinking about the larger implications of Twitter for my own classrooms. Others have apparently felt this way, given the amount of attention that academhack's post has received in the Chronicle of Higher Education as well as other places. Getting to the table even faster than academhack is EDUCAUSE, whose July 2007 "7 Things You Should Know About..." document (pdf) examines Twitter in its academic setting. JBJ has recently suggested in an aside that he is using the service to reflect briefly on his teaching. Here--at last--then, are a few more suggestions on my part for how one could use Twitter. One is to use a Twitter client like Twitbin on a projected screen while I'm lecturing. Since students will be more in listen/note-taking mode, they can use twitter to comment on what I'm saying, asking each other questions, etc. I could occasionally check the feed to see if they're following me (pun intended). This sort of meta-commentary could be distracting, but it could also provide a useful record of where I need to go back over concepts. At the same time, I could use Twitter as a free clicker/PRS system. It provides an easy way to ask a question and get students' answers readily available. Granted, you'd have to read through each answer rather than getting the answers totaled for you by software. Another use for Twitter that parallels these two would be to use Twitter as a VERY abbreviated note-taking tool, which would allow a class to crowdsource the note-taking process. They could take notes on their laptops about what I'm saying. In their archive, they would have a collection of class content. If students are following each other, they could collectively generate a lot of notes all at once. The downside to this could be that it might be difficult to read through the notes that had been taken in this manner since you can only display so many tweets per page. I'm hoping to think about other ways I could use Twitter in a classroom, and I'm hunting around the ol' internetz for any suggestions. Please feel free to suggest yours in the comments. There's a chance that this could be just a fad (that I'm radically late to) or not all that practical. Nevertheless, given the dispersion of mobile phones and the relatively high incidence of text messaging among our students, this seems to be a very effective tool for reaching our students on their own turf and for bringing the classroom a little closer to them. Finally, here's a few fun things you can do with Twitter. Twittervision is a mashup with Google Maps that shows you where tweets are coming from in real time. The 3D view is a lot of fun. Twittervision's cousin, Flickrvision is even more fun, perhaps. The British blogger at OUseful Info has taken a similar approach and designed a Yahoo! Pipe and used it to geocode your tweets. Read about how you can use the Pipe here. What I like about this second application is that while Twittervision is a random representation of the sum total of Twitterers, you can use the Yahoo! Pipe to plot just your own tweets using the RSS feed from your Twitter home page. It depends on your using a place name in your tweets, however. So you'd want to be specific in what you say in order to develop an accurate representation of where you're twittering from. You can, of course, also integrate Twitter into Facebook. And a last: Using Twitterfeed, you can have every blog post immediately broadcast as a tweet. Just...like...this. But what if you could do all that with image support, the ability to color-code and filter events by type, and the ability to locate events on a map? And what if that timeline could read data in a variety of formats–xml, json, and others? And, finally, what if that timeline could update itself in realtime from, for instance, a Google spreadsheet? Well, what you would have is the SIMILE Project's Timeline. Oh, and I guess that I might gain more Web 2.0 street cred if I were to refer to the collaborative project of populating the timeline as "crowdsourcing." I must remember this for my talk in April for the library. I just read an article from last week's Chronicle about CiteULike. CiteULike more or less works like del.icio.us, but it is for academics to tag what they are reading recently. It doesn't appear to have as much functionality as Zotero, which I wrote about last September. But--unlike the current version of Zotero--it is a shared resource. Others can browse your articles and you can browse theirs. What's more, the site draws from Emory's sfx service, and therefore can link you more or less directly to the full text of an article if we have access through our library's databases. Based on what each tool can currently do, CiteULike is a much more useful tool for research. It allows you to watch what others are reading and to take your references with you (because they're all online). Zotero has a better interface, in my opinion, and is more full featured. But until the next big release, it is tied to your local browser. And that's more or less what EndNote is. I don't know that I'm going to start using CiteULike regularly. But that's got more to do with my not having internet access of my laptop than anything else.